Hello! I'm not sure if this will be of much use anymore, but i want to share it all the same. 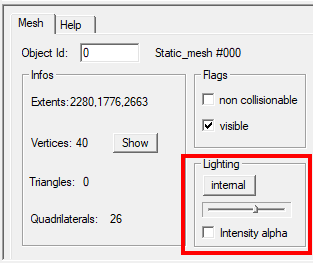 The button changes between the 2 modes: "Internal" and "External". The slider controls the light intensity if the method is set to "Internal". Left is darker, right is brighter. Now i will explain for each type of object which option is the best and how to set it. And secondly any light placed in the room will further alter the lighting. Additionaly, flares or bullet weapons being fired. This is the way that is set in the original levels for movables. Lara or enemies for example, are always set this way. Setting the lighting to internal in movables produces bad results, particularly movable boxes. I have made that mistake myself with boxes in my current project and need to fix it. Remember that certain movables in the original levels appear black ingame? That's because they have lighting set as internal and the slider all the way to the left! This lets you fine-tune the lighting for individual decorations, so the objects will blend well with the room lighting, and you can set them lower in darker places of a room! Their lighting will still be affected by other light sources same as with movables before. As always in Dxtre, 31 is darkest and 0 brightest. By default, the statics in original levels are set this way, but if you import statics from other levels, like .TR4 ones, you will likely need to change them. Even if the lighting of sprites cannot be altered in TRViewer, it is still possible to alter it inside Dxtre! It is done the same way as statics, by changing the "white" option. The optimal range is between 0 and 16/17, if set to 17 they appear almost totally black. Doing this is a matter of preference. Personally, i prefer it this way, because pickups no longer are "shiny" and you need to search well to earn them.